On this fascinating tour of Jewish Venice, you’ll learn the history of the Jewish community since its beginnings in Venice during the second half of the 14th century. Your walk begins in the Piazza San Marco, the seat of Venice’s government where political decisions about the Jews and other foreign communities were made. Your guide will then lead you to the Rialto Market area, which for centuries has been an important center for commerce and banking. Here, following the fictional footsteps of Shakespeare’s Shylock, you’ll learn about the economic history of the Jews of Venice and the rest of Europe. After crossing the Grand Canal on a gondola ferry, you’ll pay a visit to the Jewish Ghetto, established in 1516 when Venice’s government forced the city’s Jews to move to the area. 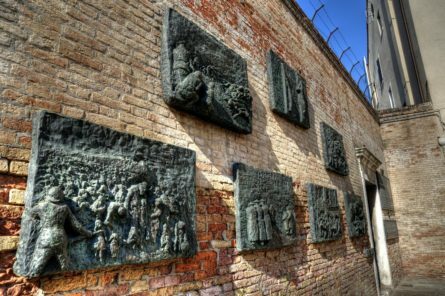 During your visit, you’ll retrace the community’s history and learn why the Ghetto is still a center of Jewish life in Venice today.